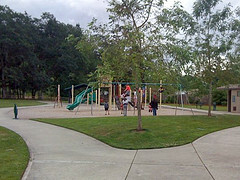 The city of Lakewood has 10 parks and one game refuge and today I stopped at Wards Lake Park at 2716 84th St South. I found it by following small sign off of S. 84th Street. This 20-acre park is a little oasis in a relatively built up part of town. It includes Wards Lake, a fishing pier, playground, picnic shelter and trail system. The lake doesn’t look conducive to swimming, but it is great for fishing and is very pretty. 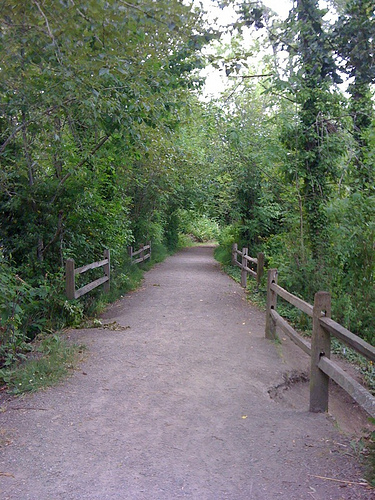 There is a short trail that leads back to some picnic tables and benches. And for the younger set there is a nice play area. I saw children playing on the big toys, an older guy fishing and a young couple getting to know each other. 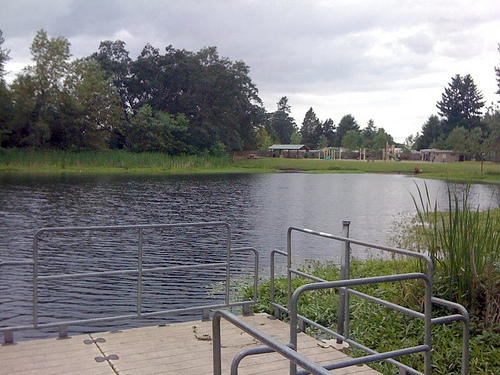 This entry was posted in Lakewood, Parks, WA State - Pierce County and tagged benches, fishing, Lake, Lakewood, Park, picnic, play area, Playground, tables, trail, Ward's Lake on June 30, 2011 by admin. 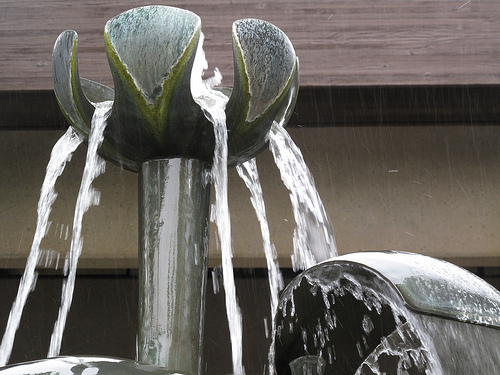 This entry was posted in Art -- there is art here!, Lakewood, WA State - Pierce County and tagged 1964, Case Bank, George Tsutakawa, Japanese, Lakewood, Lily Fountain, Tacoma Weekly on June 29, 2011 by admin. 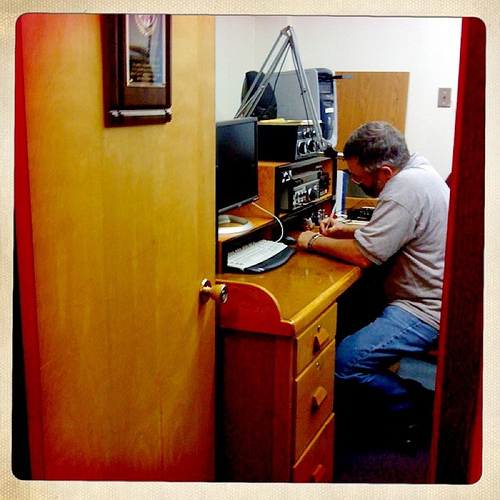 Today the Radio Club of Tacoma was kind enough to host a bunch of us newly minted ham radio operators. While there, they offered us some hints on buying equipment and a tour of their clubhouse, which is filled with wonderful equipment, both newish and antique. Outside is a huge antenna and several smaller ones too. 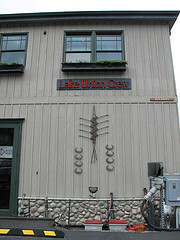 This entry was posted in Non Profits, Tacoma, WA State - Pierce County and tagged antenna, clubhouse, ham radio, radios, Tacoma, Tacoma Radio Club on June 28, 2011 by admin. 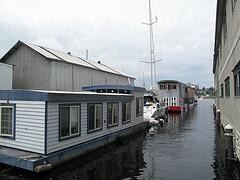 This entry was posted in Government, Non Profits, Seattle, Sports, WA State - King County and tagged Crew, floating, Lake Union, Seattle, Space Needle, WA State - King County on June 27, 2011 by admin. It is farmer’s market season and there is one available for most days of the week. Sunday’s market is the South Tacoma Farmer’s Market, the newest Tacoma market and it is located on the corner of Washington Avenue and South 56th in the Heritage Bank Parking Lot. It is a bustling market, with produce, flower’s, informational booths and art & crafts goods. I especially enjoyed the musicians playing. 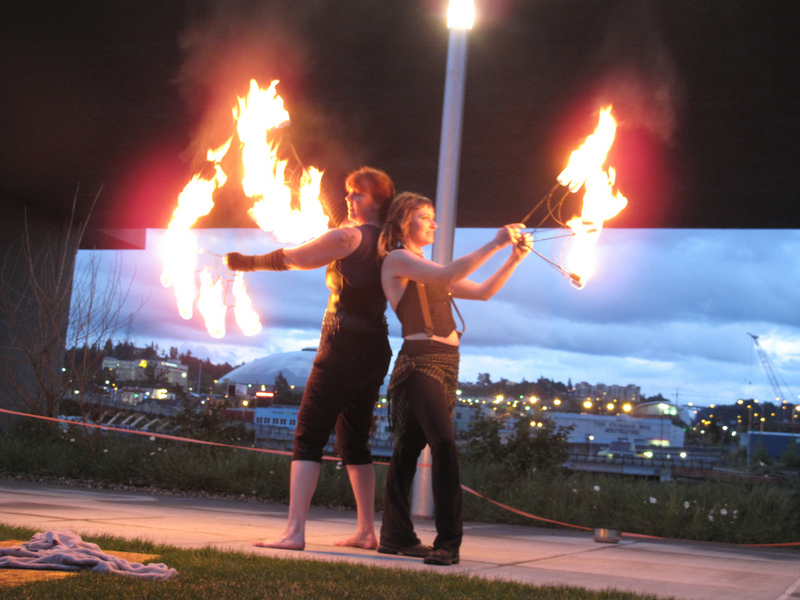 This entry was posted in Art -- there is art here!, Community Space, Farms and Gardens, Tacoma, WA State - Pierce County and tagged farmer's market, fruit, Heritage Bank, South Tacoma, Tacoma, vegitables on June 26, 2011 by admin. 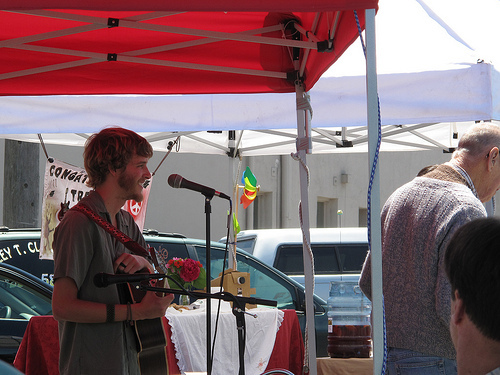 Saturday we happily went on the Urban Chicken Coop Tour, organized by Garden Sphere in the Proctor District. I’m considering the tour one large place! We managed 8 or the 9 stops on the Tacoma tour and were so impressed with the graciousness, knowledge and openness of the owners and the good looks of the urban chickens! While we don’t qualify for chickens ourselves because of our two terriers, I can certainly see the appeal. 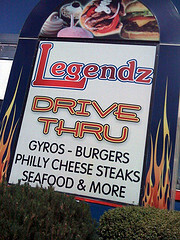 This entry was posted in Big Areas! Cities, Districts, Neighborhoods, Farms and Gardens, Once in a while events, Tacoma, WA State - Pierce County and tagged chicken, chickens, coop, Garden Sphere, Tacoma, tour, urban on June 26, 2011 by admin. 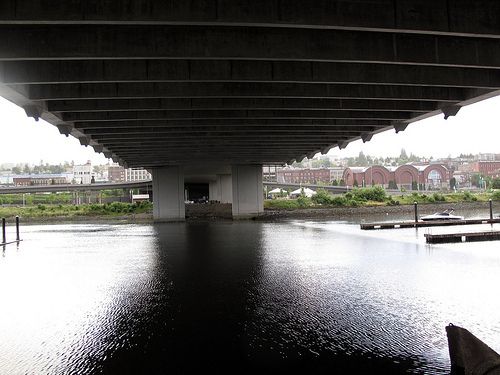 The 21st Street Bridge connects downtown Tacoma with the Port of Tacoma and is part of SR 509. 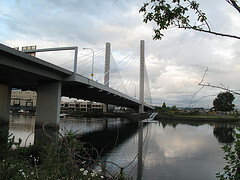 The cable stay bridge was constructed in 1996 to replace the 11th Street Bridge (the Murry Morgan Bridge). 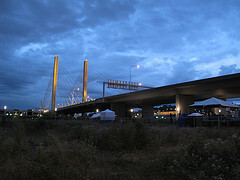 This entry was posted in Art -- there is art here!, Government, Tacoma, WA State - Pierce County and tagged 21st Street, art, Bridge, Downtown Tacoma, Flair Entertainment, Port of Tacoma, Tacoma, WA on June 26, 2011 by admin. 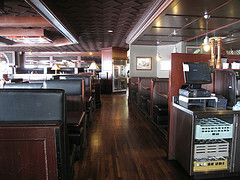 I’ve been to The Beach Tavern at 8612 6th Avenue once, a while back and remember enjoying my burger. 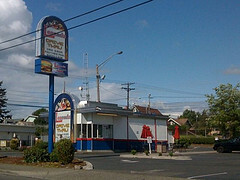 It is the kind of place that is comfortable and has been around forever (since 1934). 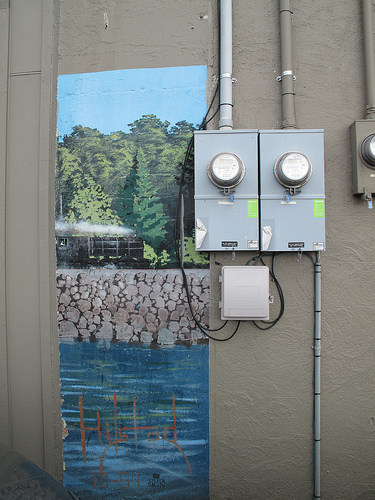 On side wall is a charming mural showing the nearby rail line. 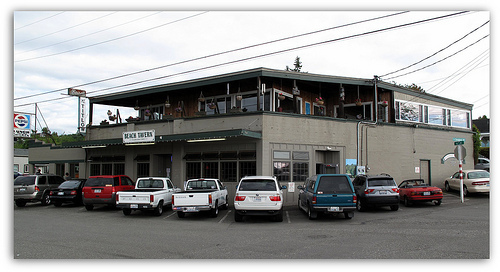 The tavern’s setting, near Titlow Beach, is beautiful. 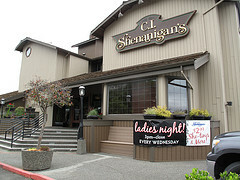 This entry was posted in Over 21, Restaurants, Tacoma, WA State - Pierce County and tagged Beach Tavern, burger, Titlow on June 22, 2011 by admin.